This month we talk about brain health. Brain health is important for everyone, not just those who are experiencing symptoms. Preventative brain health and protection is the best form of brain medicine. In the article below we discuss a few basic ideas that have been proven to enhance brain health. This month we are also introducing our new Neuromovement practitioner , Sue Burgman. Sue specializes in a unique method known as the ABM Neuromovement approach. This approach uses the unbelievable ability of the brain to rewire itself and change neural pathways to compensate for injury or disease. This is known as Neuroplasticity. You can learn more about this method below, on our website and in this months Fernie Fix magazine. Needless to say we are ecstatic to have Sue practicing from our clinic and offering such a beneficial brain and physical recovery therapy to the East Kootenays (She is the only practitioner between Calgary and Osoyoos!). Dr Doucette also has an affinity for brain health. Dr Doucette focuses on brain recovery from concussion, head trauma as well as stroke, TIA's and other forms neural cognitive decline. Her focus on brain health comes from a deep interest in preserving optimal function as well as her empathy for under treated and under diagnosed conditions that people suffer from daily. She is looking to get involved with the Brain Injury Association locally and working with patients who will benefit from her evidence based approaches. Keep thinking, Keep moving, Keep cognitive! Dementia is more complex than most people realize. Although Alzheimer's disease is the most common cause of dementia, many other diseases can play a role. Mild cognitive impairment (MCI) happens when someone experiences enough impairment to be noticeable, but not enough for a dementia diagnosis. People with MCI are more likely to develop Alzheimer's disease. Everyone experiences some moments of "brain fog" from time to time, whether they're trying to find their keys or are struggling to remember a name. As we age, these little moments of forgetfulness become more worrying. And in fact, the damage from Alzheimer's can start up to 10 years before symptoms become troublesome. But stress, fatigue, and nutritional deficiencies can all contribute to cognitive issues, even without Alzheimer's. The good news is that foggy thinking and poor memory don't have to be a normal part of aging. Cognitive decline is not inevitable. And the steps to protecting our brain health can also help the rest of our bodies - further evidence that everything is connected when it comes to our optimum health! Get enough sleep. A great deal of research supports a link between brain health and adequate sleep. Scientists think the relationship may work both ways: not getting enough sleep can lead to cognitive decline, but cognitive decline can also cause sleep problems. Either way, the best approach is to be proactive. For example, avoid substances like caffeine or alcohol before bed. Practice good sleep hygiene by sleeping in a cool, quiet room and pay attention to when the body wants to sleep. Your circadian rhythm is your natural sleep cycle, which is ideally around 10-10:30 pm. Fighting it and staying up later sends an adrenaline rush to your body to keep it awake. Talk to a healthcare provider if sleep issues interfere with daily living. You may also find that following the other tips on this list help with sleep - did I mention that it's all connected? Focus on a plant-based diet with plenty of healthy fats. Good nutrition fuels our brain. Processed, low-nutrient foods can lead to inflammation and oxidative stress. The result can be cognitive and mood issues. Up to 95 percent of the serotonin in our bodies is produced in our gut, so what we eat can have a profound impact on our emotions and the way we think. As a result, having adequate "good" bacteria in our gut can reduce the inflammation throughout our bodies, so it's important to eat with this in mind. Omega 3: This fatty acid has been shown to lower levels of beta amyloids, which are the building blocks of the amyloid plaques in the brains of Alzheimer's patients. Look for fatty fish and plant-based sources like flax seeds or avocados. Move to keep your brain active . 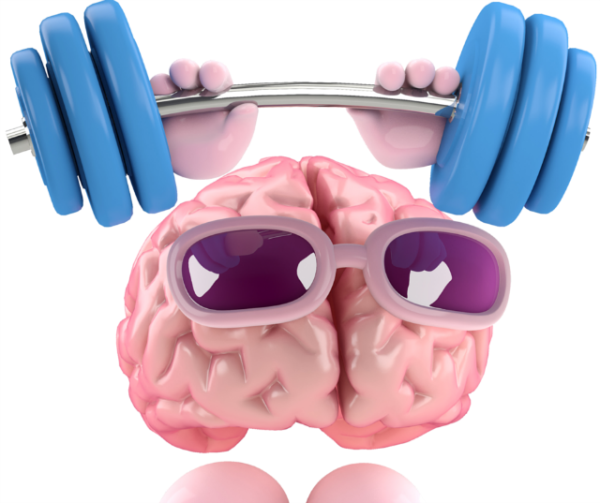 Exercise is a must when it comes to brain health. Not only can cardio activities like swimming and walking ease stress, but physical activity can also increase the size of the hippocampus. That's the part of our brain responsible for verbal memory, among other important functions. Which exercise is best? The best activity is always the one you're most likely to do, but experts say to strive for 75 minutes of intense activity or 150 minutes of moderate activity every week. As an added bonus, exercise can help you sleep! Keep learning. You're never too old to learn something new. In fact, acquiring new knowledge can help keep your brain young. One study found that adults who learned a "complex skill" such as quilting or basic coding had improved memory function after only three months. And knowing a second language (even if you learn it late in life) can help slow memory loss. Relax. You've probably noticed that when you're stressed, your thought process isn't as clear as it is when you're relaxed. Scientists confirm that even short-term stress can affect the hippocampus. It's important to note that most studies refer to a relationship between perceived stress and memory. We all have negative events in our lives and some of these can't be avoided. But we can change how we react to them and how we deal with daily stress. It's possible to reframe the stress of daily life and change how we perceive it. Yoga, meditation, tai chi, and cognitive therapy are all effective ways to reduce our feelings of stress. It's important to remember that there isn't necessarily a "magic bullet" solution to protect your brain function. As with all elements of well-being, maximum health is the result of a holistic approach. By taking conscious steps to protect your brain health, you can minimize memory loss. Please visit the office if you have questions about your brain health! And if you've noticed any symptoms that worry you, it's important to check them out right away. Sue was born and raised in Switzerland. She moved to Canada in 2005, where she pursued an academic career in the Insurance Industry. When her son was born in 2014, their family's life changed dramatically. After his birth their family struggled with challenges they never expected to encounter. Her son was diagnosed with a rare genetic condition, causing symptoms similar to Cerebral Palsy. For years they tried every suggested and referred approach they were told about to help him improve his quality of life. Things were very slow and little difference was noted. Her family then found ABM NeuroMovement, through which her son has excelled far further than his prognosis suggested he ever would in his lifetime. He has shown improvements on all levels, physically, in communication, cognitively, as well as emotional/behaviourally, without any pharmaceutical medications. Because this work has been so meaningful for her son's development, but not very easily accessible due to a lack of practitioners in Canada, Sue joined the intense practitioner training in the United States in Fall of 2017, to enable her to help her son at home, as well as help other families find this beautiful, life changing path. Sue is still in intensive training for the Children's Mastery ABM Neuromovement until November 2019. Until then, she is accepting appointments for adults. Once completed, Sue is looking forward to specializing in the area of helping children with special needs.